A week ago I was getting home from a relaxing retreat in Arkansas. We were there about a week or two after the peak leaf-viewing season or so. Some retreat experiences out of the norm. 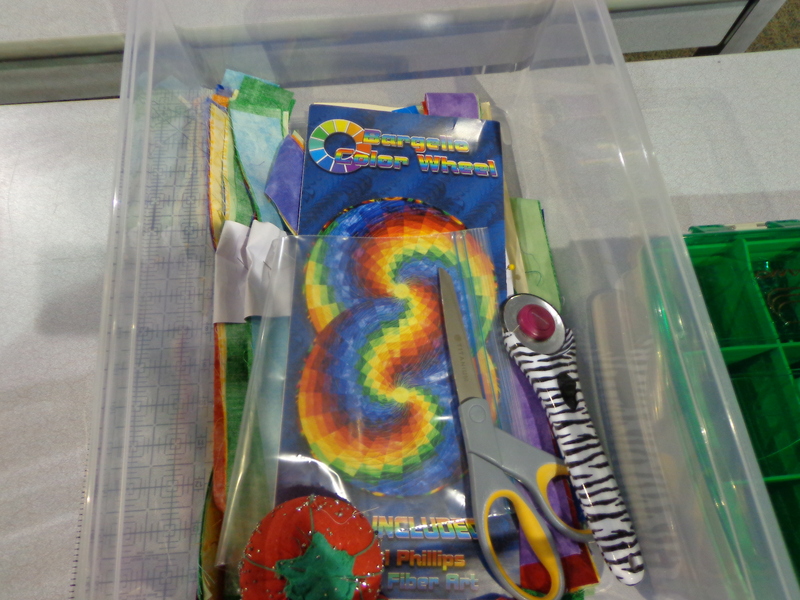 On the way, we went to a quilt shop with consignment – Village Quilting in Bentonville, AR. The ladies had cards they were sending out to the service men & women. So I signed one. And they had a completed small version of the quilt I was SO SURE I wanted to work on at retreat when it turned out that I didn’t have enough fabric (haven’t posted it yet). And those of you who know me know I would love making that quilt, and I will some day. The quilt shop lead us to a great local Bentonville cafe, The Station. Yum! Yummy sandwiches & they serve kolaches (didn’t get one, but kolaches are from my past) & pies. And license plates. And then we were in Winslow Arkansas at a wonderful bed & breakfast called the Sky-Vue Lodge. Where they go out of their way to be nice, help with bags, feed us well every day & night, love on us, & let us love on them back! We have our normal sewing room. With lots of natural light, where we have to play with the window shades in the morning. We had show & tell somewhere in the middle when I was still awake!! And I was very happy! Saw this quilt being put together all weekend. … using a fabric called “cuddle” which is a softer, lighter less textured version of minke fabric. So it was “sew stinkin soft” too. And there were a few off/road adventures which I readily welcomed as part of my “vacation”. The arts museum across the street had different items on display. Complete with yarn bombed poles & trees! And on Saturday, we adventured to the craft show at the fire station. These handbags I loved & thought about getting. And this sweet doggie hadn’t really been inside much before. And on the way back, we went to an inside sale. Basically an ongoing garage sale inside some lady’s house (never been to one before). At the inside sale, we saw a couple of old ruined quilts, one of which was over quilted on a completed quilt. She had pretty linoleum flooring though. Quiltworthy flooring. Up in the wonderful mountains. Another top from someone else’s finish! And we all got T-Shirts from the lady who does the massages who has some form of PT training as well. She apparently knows her stuff and so I am glad to help her advertise with the far-out shirts she gave out! And here is what I was working on, the King’s Puzzle. It’s been an interesting month. I didn’t realize it would be an entire month before posting, but here it is. It’s also been an interesting week. What with going to my guild’s annual retreat and all. And then the bereavement day. And the snow day. And now the days picking up the rest of the work resulting from snow delays, and in the future (monday), possibly more snow. It seems things just have to be interesting right now. I should show you what I worked on Thursday as a compliment to what I have started with at the retreat. I have reworked the corners of this quilt, removed the bright yellow inner border. 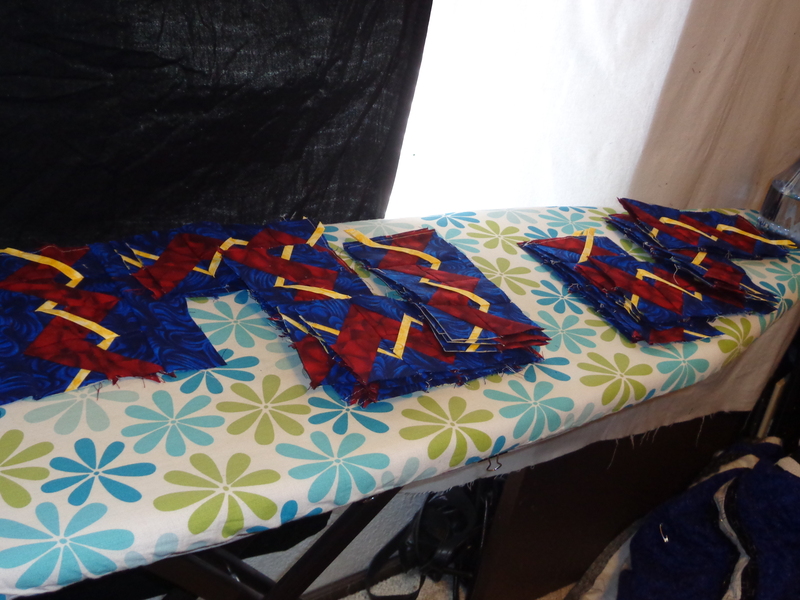 During retreat I created a total of 16 blocks of each direction of the weave border before I ran out of red fabric. 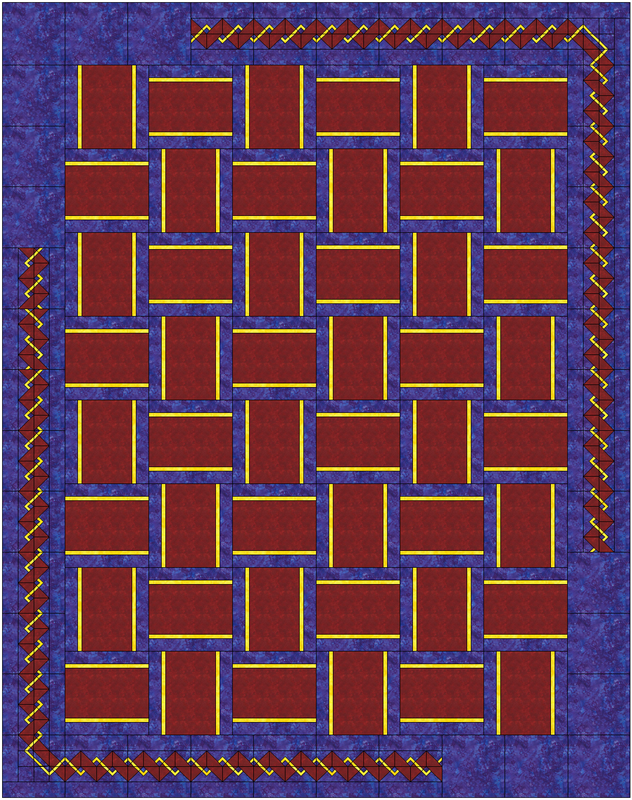 I needed to have 19 blocks of each direction to complete the pattern all around plus the fabric for the corners. I think this looks atheistically pleasing, and repeats the same numbers of blocks on each leg of the border as in the center of the quilt. The design you see above requires 14 blocks of each direction and so I’ll be unpicking two of my completed blocks and reworking them to make the corners. If it’s possible to do, I kept similar dimensions and requirements of red for the corners compared to the original blocks. I currently have not designed the ends for the borders. I was trying to make the design wrap around itself, but EQ crashed for the 3rd time, so I didn’t bother retrying right now. Instead, I chose other computer time. At least I have a direction. And I have removed the papers from about 20 of these blocks too. Oh yeah, I need to start working on the tutorial for these blocks. Pictures have been done for a few weeks. Getting there. Okay, well after spending 2+ days on 9 blocks, I got out some projects that just needed borders. So you remember the samurai Sudoku quilt I made, now it’s got its borders on, and just wowed the people at the retreat how well the borders work and are also very contrasty. So now it floats in the middle of all the borders. 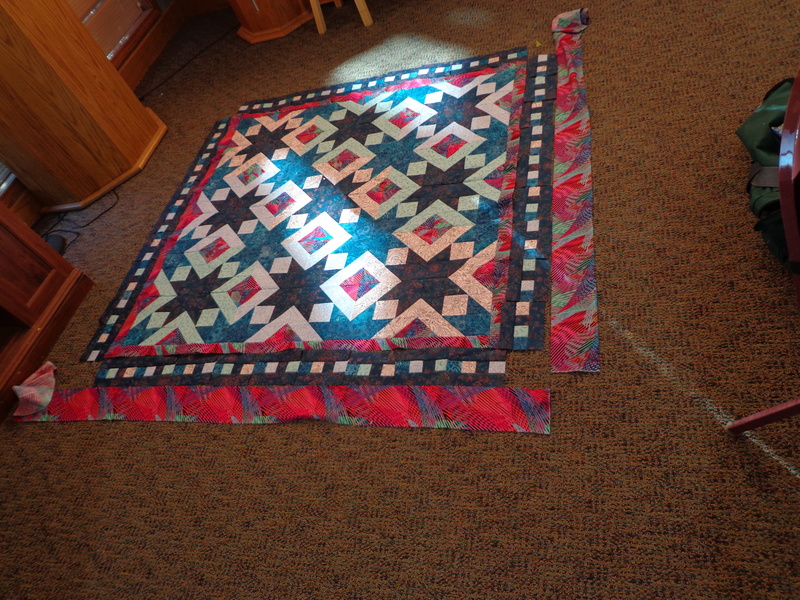 I normally don’t like a lot of big borders, but this quilt it seemed to work quite nicely. And the last quilt I also was working on borders for. 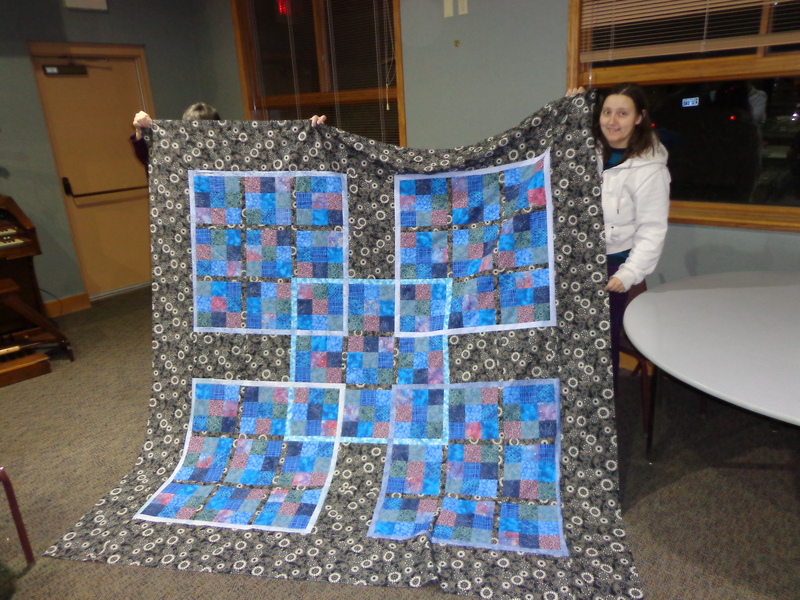 The mystery quilt I did with my guild called Gemini Sky. Obviously, this picture was taken at a time when the lighting was way different. The whole picture/quilt is too pink compared with real life. I didn’t get the borders sewn on after the bright pink border, but I did add the ‘filmstrip’ quality to the already fabulous and sewn strip border. I designed a few cornerstone blocks for the corners, but this quilt we were really rushing to work on as it was on the last day and I wanted as much sewing time as possible, also knowing I had to pack up & leave soon, so no pictures beyond this point. Gemini Sky looks way different than I expected, but I really like it. And if I may share one other situation from the retreat that I was a ‘small’ part of…. 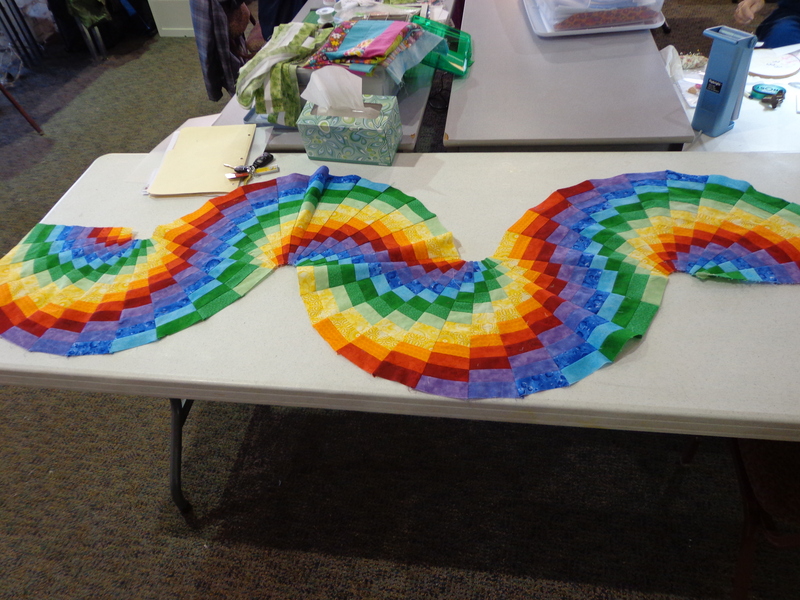 There was a lady who was working on a double bargello rainbow quilt twist pattern. Not my quilt, but hey she is a math teacher, and what can I say, I really liked this quilt idea. Great minds think alike. I would venture if I saw this pattern, I would try it out. And so over the course of the few days, she worked on it and worked on it. 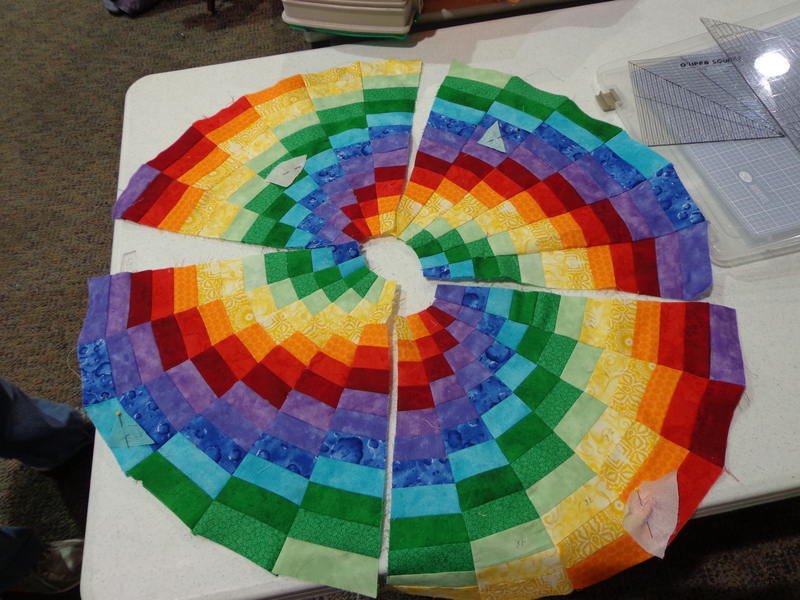 The quilt requires you to sew strips and then cut the strips with a specific wedge template, sew them together in circles, and then cut portions of both of the circles, and then sew it together. And just as what happened to me with my dancing ribbons, things weren’t lining up all that well in the wedge shape. So we talked about it what to do to fix it, she asked another math person, and they said to tighten up all the seams coming in and out of the circle. I agreed that would help, emphasizing the amount of sewing in the center of the circles to help tighten the thing up. And so the lady did just that, and then had both circles laid out, and things still weren’t matching up, and she wants to get this quilt finished before April (for her other guild’s quilt show), and what she was doing to fix it wasn’t helping enough to work without some MAJOR reconstructive surgery. So on the very last day, I saw the two circles together, thought of dresden plates or drunken path blocks, and came up with a solution that I think she liked. Just one of those things, “well what if you placed this piece here” type of things. To save a quilt from “certain destruction”, here’s the resulting pattern which will be appliqued onto something. (or could stand alone I guess). I am amazed that the rainbow pattern works too with this quilt. I am glad she didn’t have to trash the quilt that she had already put so much work into, and as I said, I think she likes this design too. Best part is that with this design, you just have to be “close” to a quarter circle, so all that extra tightening, not quite necessary. no further seams to match up. Wheew! Sew happy to have been able to help! Sew glad to have been able to see the possibilities with the design! Alright until we meet again. It’s almost March-A-Long time. I need to start working on that after work again, march starts the end of this coming week!!! AACK! Expect another post pronto.